Joining Ken for the performance are Lisa Theriot, Michele Buzbee, Kevin Valiquette, and Robert Ferrell. 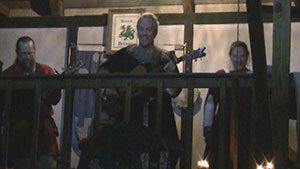 The Green Dragon Tavern is a wonderful live music venue built specially for the medieval-themed annual festival called Gulf Wars, an event of the Society For Creative Anachronism (SCA). It was a perfect place for the release concert for the new album.